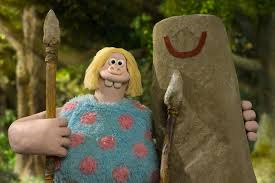 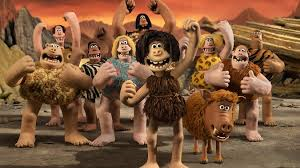 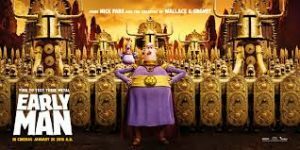 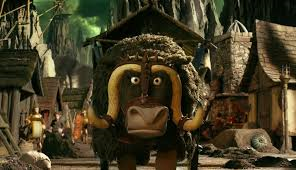 Adorable, funny, family friendly, typical sports outing about an underdog cavemen team playing soccer against a more sophisticated "Bronze Age" team to win their valley back, all brought to us by Nick Park and friends, the creators of SHAUN THE SHEEP!!! 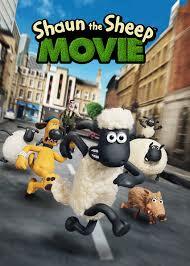 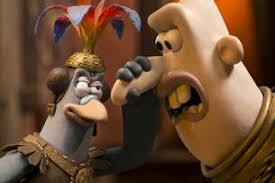 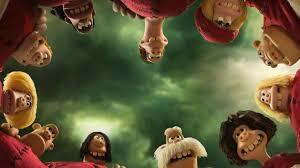 If you like Wallace and Gromit or Shaun the Sheep or Chicken Run or The Wrong Trousers or…. 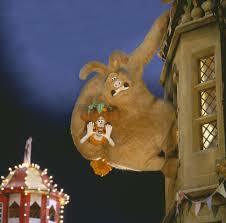 oh EVERYBODY!!! 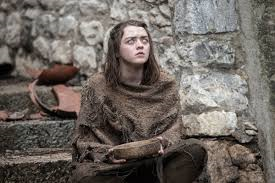 What do the fantasy franchises: Harry Potter, The Avengers, Game of Thrones and……. 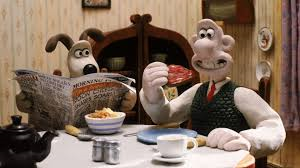 Wallace and Gromit have in common? 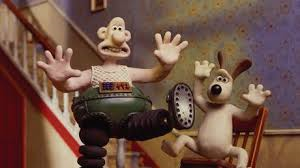 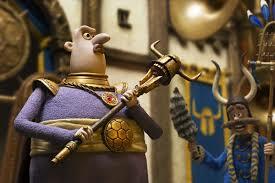 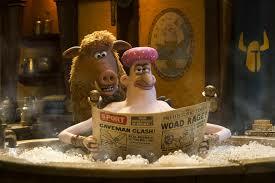 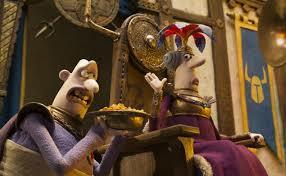 Wallace and Gromit????!!!! 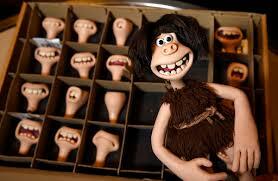 The answer is: Early Man. 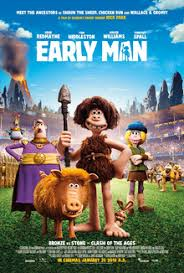 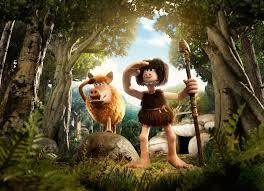 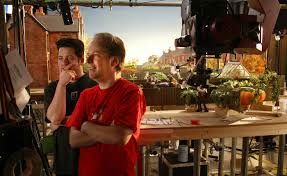 Early Man is an adorable plasticine animation feature length movie brought to you by the same instigators, led by Nick Park, who created The Wrong Trousers, and The Curse of the Were-Rabbit. 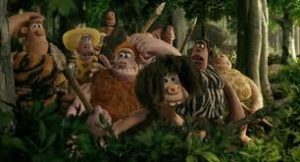 With tongue firmly planted in cheek, the story is spun about the lives of a group of Cavemen who were forced into the lone habitable spot by a meteor which devastated the rest of the known Earth. 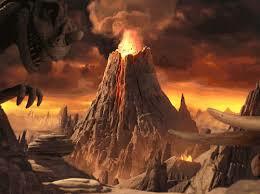 Their valley is lush and green, where all about them is the Badlands: with dangerous mutant animals, harsh rocky ground, and volcanos. 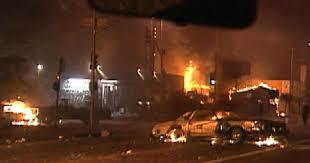 The Badlands looks a bit like I'd imagine the Wembley Stadium parking lot after an EFL Championship game. 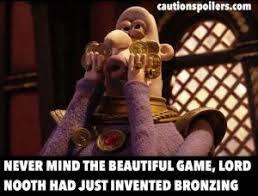 But there are a couple of silver linings. 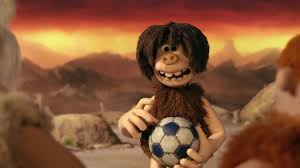 Not only did the meteor strike carve out at least this one fertile area but the meteor, itself, also gave them the template for history's first football. 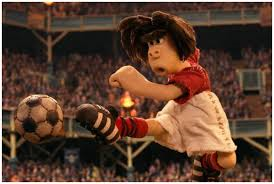 By that, for those of you reading in America, I mean soccer. 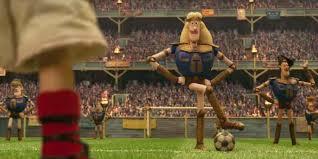 But the Brits call it football, so there it is. 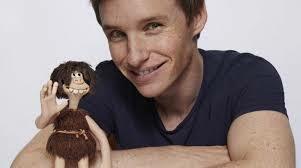 Fast forward a couple "eras" and Dug (voiced by Eddie Redmayne – Newt Scamander from the "Harry Potter" world of Fantastic Beasts) and the tribe of which he is a member, happily lives on fruits, nuts and the odd rabbit (which said presented rabbit is about as catchable as Bugs Bunny so, in effect, they are de facto vegetarians). 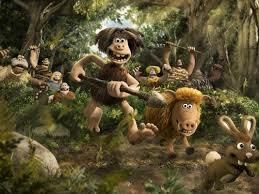 But Dug is ambitious – he wants to hunt mammoths………! 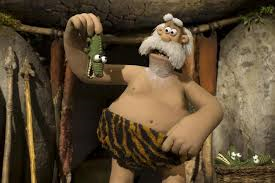 But that's not what the story is about. 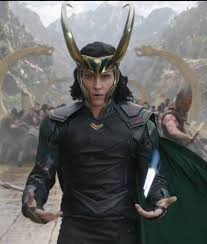 Their idyll is interrupted when Lord Nooth (voiced by The Avengers' Tom Hiddleson) sporting an impenetrable guise of Italian accent, comes upon the scene with equipment made of the bronze which he has mined from his nearby kingdom. 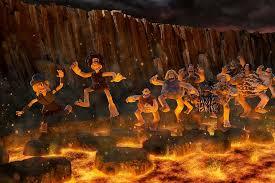 Dug challenges them to a game of soccer/football to win their valley back. 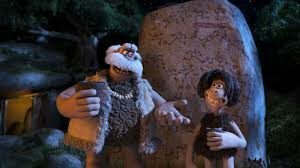 Completely outmatched, Dug's group has no equipment, no training, no experience and doesn't even know the rules, but his chutzpah gets the attention of a local girl, Goona (voiced by Game of Thrones' Maizie Williams) from the Bronze kingdom who coaches Dug's tribe in exchange for a spot on the team. 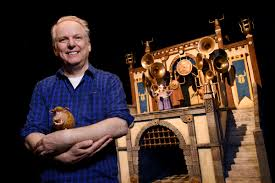 Nick Par, the creator, even lends a hand — or voice — for the emotive and communicative grunts and snorts of Dug's intelligent pig, Hognob. The story is a pretty formulaic case of underdog team goes up against much better players with nothing but a good cause, lots of heart, and a ringer. 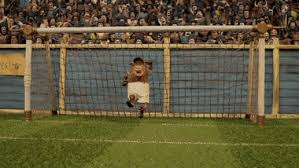 We've seen the like in everything from The Karate Kid (karate) to Facing the Giants (American football) to Bad News Bears (baseball) to Mystery Alaska (hockey) and Balls of Fury (ping pong), and it works — every — time because, as Patton put it so well – "Americans love a winner" and everyone loves the underdog because in them we all find inspiration. But this time it's played for laughs, parodying the sport, the genre, diva professional players, sports announcers, a "win one for the Gipper" moment, a hen pecked husband, you name it. 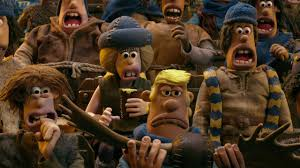 It's a clean, gentle, lovable movie that kids will enjoy for the claymation/plasticine animation and adults will appreciate for the pokes at the cliches. 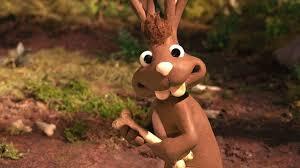 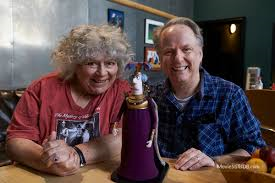 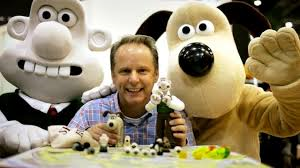 While there is a good deal of spoofing and teasing, there's not a mean spot in Nick Park's entire imaginative brain. 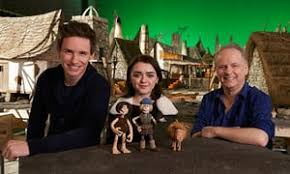 The cast list is like an old home week of favorite kids' characters, especially from the Harry Potter franchise. 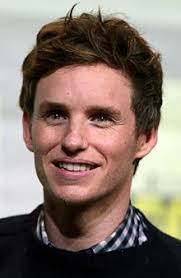 So when you take your kids you can happily point out that Eddie Redmayne is both Dug and Newt Scamander. 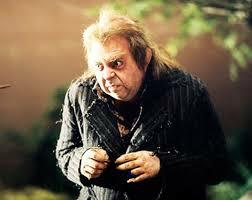 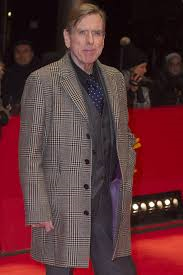 Timothy Spall, who voiced Chief Bobnar also moonlighted as Peter Pettigrew. 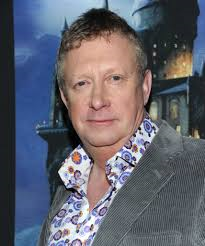 Mark Williams, who does the voice for Barry, was also Mr. Weasley. 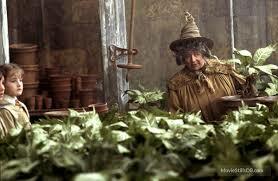 Miriam Margolyes, who voices Queen Oofeefa was also Professor Sprout. 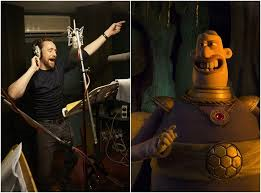 And Tom Hiddleson is Lord Nooth and Loki! 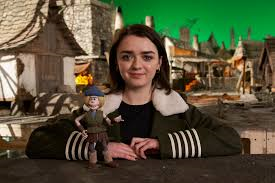 I'll let you figure out how to explain Maisie Williams' stint in Game of Thrones. 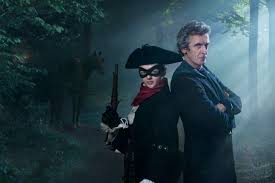 But, if it helps, she was also in a handful of Dr. Whos.